Those lucky enough to experience parma night at the Prince, (or ‘Jimmies’ as it was known in the area) were fortunate enough to have tasted the greatest example of a Chicken Parmigiana ever to grace the land, An enormous, succulent chicken breast cooked to perfection with the perfect amount of rich napoli sauce and a layer of bubbling golden brown cheese so heavenly, so purely ambrosial, you would swear it came from the nectar of the gods themselves. Resting beside the chicken was a truly outstanding medley of sides. Firstly, a garden salad of lettuce, onion, capsicum, tomato & alfalfa sprouts tossed though a light cream dressing. Alongside that a delectable home made potato salad and if that wasnt enough, pasta salad was right there too. But all of these sides paled in comparison to the beer battered plank style chips, always cooked and salted to pure excellence. With all the sides and the chicken combined, this was the epitome of the chicken parmigiana. Unequivocal. Indisputable. Unbeatable. Now what would a good storytime be without some pictures? Photos of the Jimmies Parma are rare, purely because nobody waited around long enough to take a photo, as soon as your parma hit the table the knife and fork were already taking their first slice, but after much research i have managed to unearth this, slighty blurry, image. Now the popularity of this parma was epic, in its later days you would have to book a table in advance or you would be sorely disappointed when you arrived to a sea of hungry parma-goers all itching for their weekly fix. In December 2009, a fire tore through the second home we all knew and loved, leaving its thousands of hungry patrons without a place to get their Wednesday parma fix. Not knowing whether they will get their glorious parma back they are stuck in a hellish parma limbo. But like the phoenix rising from the ashes, we will survive. 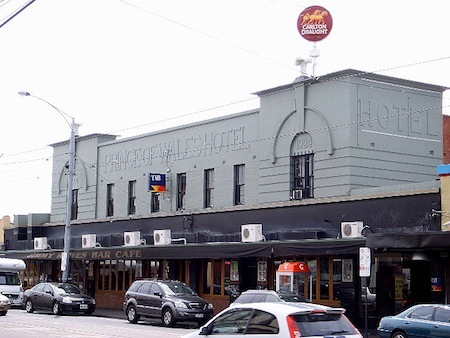 A team of Ex-Jimmies patrons are now on a weekly hunt of pubs around Melbourne (the Parma capitol of the world) to find a replacement, I will report our findings back to this page as a record of our journey. Because until we find a place to gather, share a beer and a delicious meal, we will wander the streets, forever trapped in a Parma Daze.